In some cases, changes were still being made to the official versions of anthems even as the first recordings were being made in the opening decades of the 20th century. 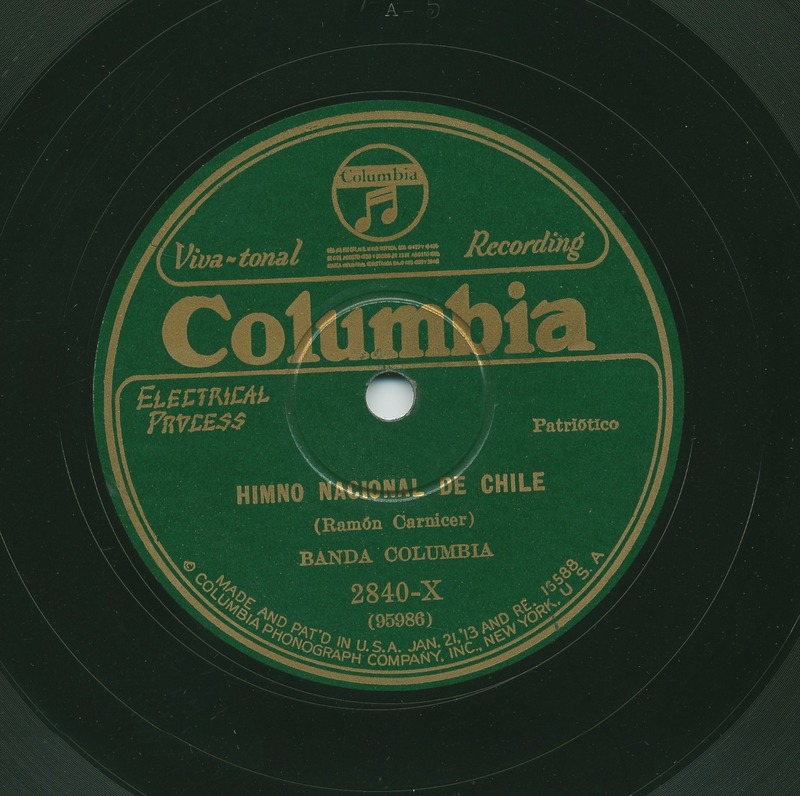 All of the patriotic anthems in the archive come from that early period of recording history, on 78-rpm discs. In all but one case, the archive has only one recorded version of each anthem from these nations, in contrast to the multiple versions of the Mexican anthem. Only Panama has two. In this installment, we focus on four anthems from South America – Peru, Venezuela, Chile, and Argentina. In each case, we get a glimpse into the anthem origins, its composers, and some curious historical anecdotes. The first verse of the Peruvian National Anthem has always been the problematic part. Unlike many other rousing and uplifting anthems, Peru’s national song starts with a stanza that some have called depressing and discouraging, if not a total downer. The British newspaper The Guardian went so far as to call it a “dirge,” citing its references to “oppressed Peruvians,” dragged in chains of “cruel servitude,” fighting to shake off “the indolence of the slave” and who finally raise a “humiliated neck” in revolt. It’s enough to make downtrodden Peruvians tune out or, as the paper suggests, “reach for an antidepressant.” For more than a century after its creation in 1821, efforts were made to change the lyrics, but to no avail. The anthem’s history coincides with the birth of the country itself. José de San Martín, who led wars of independence against Spain in the southern part of South America, wasted no time calling for a new national anthem for Peru, one of three countries he liberated as leader of the Army of the Andes. 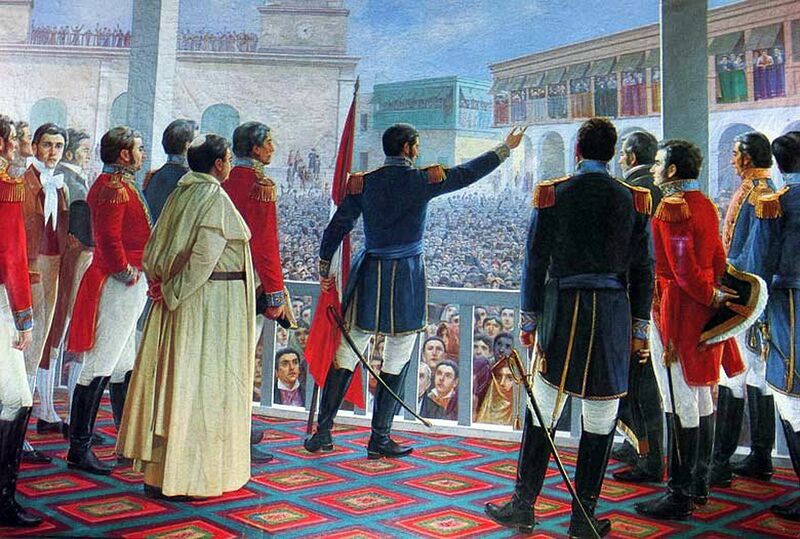 In August of 1821, just one month after Peru’s victory against Spain, San Martin announced a contest for a “national march” for the new nation. The winning entry was composed by José Bernardo Alcedo, with lyrics by José de la Torre Ugarte y Alarcón, a poet, lawyer, jurist, and politician. Their work was performed publicly for the first time on September 23, 1821, before an audience in Lima that included the Great Liberator himself. Alcedo, the composer who conducted the orchestra, received a standing ovation. Multiple attempts over the years to modify the original anthem fell flat. New lyrics were approved in 1901 because, as in the case of neighboring Chile, the original verses were deemed too hostile to Spain. But the public insisted on the original words, which were restored. More than half a century later, in 1959, Chabuca Granda, Peru’s premiere popular songwriter, penned a new verse to replace that problematic opening stanza. But her new lyric was never adopted, even though she had written it at the request of Raúl Porras Barrenechea, a respected and influential diplomat and historian. The matter was not definitively settled until almost half a century later when Peru’s Constitutional Tribunal, an independent judicial body, ruled in 2005 on the anthem’s final form. It determined that the offending first verse was, in fact, not written by José de la Torre Ugarte. And yet, it was too ingrained in the nation’s tradition to discard. The tribunal also restored a lost verse, bringing the total verses to seven. "Our existing hymn is too negative," Rivera told the newspaper. "It damages the self-esteem of the population and breeds an inferiority complex. It encourages conformism, indifference and apathy—and we're already too submissive." By then, the Peruvian military had sidestepped the issue by deciding to play the more upbeat seventh verse, instead of the first, as part of its official ceremonies. 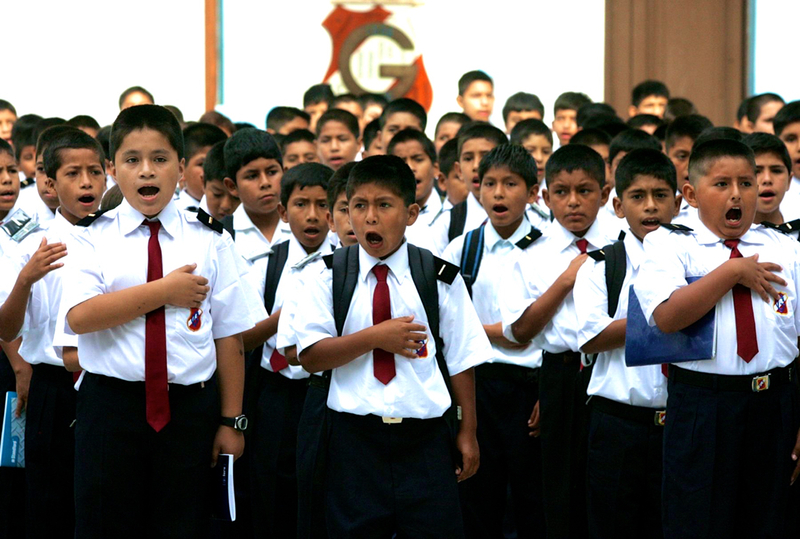 The military’s move in 2009 helped establish that version as the official one sung at Peruvian schools, sporting events, and other civic functions. 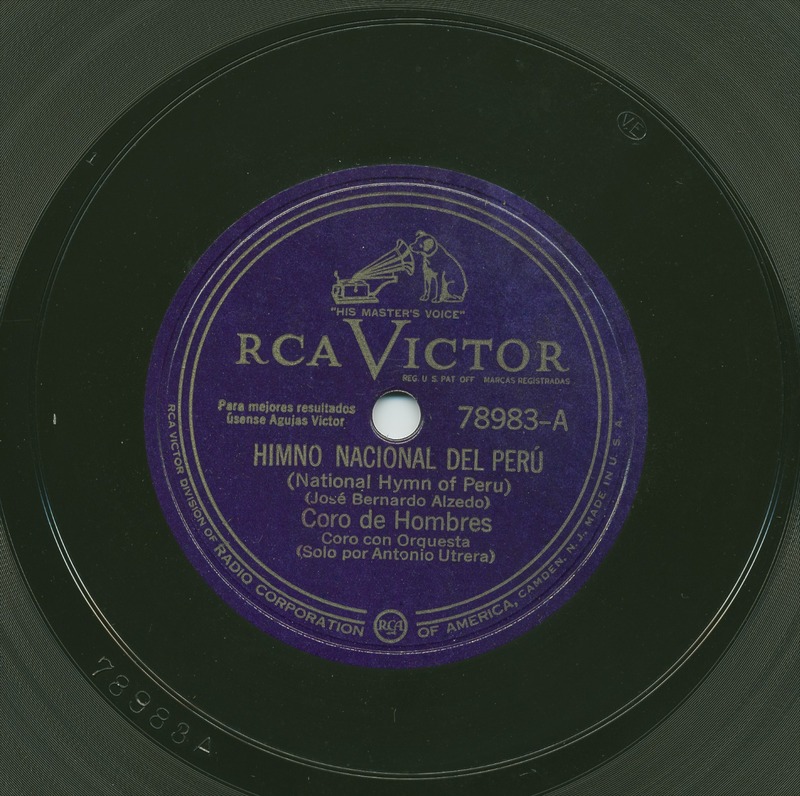 The Frontera recording, on an RCA Victor 78-rpm disc, still features only the maligned first verse, performed by a male chorus with the vocal solo by Antonio Ultrera. The U.S. label, however, misspells the composer’s name as Alzedo, and fails to credit De la Torre Ugarte, whose lyrics survived two centuries of controversy and attempted revisions. The Chilean National Anthem went through three incarnations by four composers before it was adopted in 1847. The first version, which debuted in 1820, featured music by Manuel Robles and lyrics by Bernardo de Vera y Pintado, a poet, politician and lawyer who had emigrated from Argentina. However, the original melody was considered too folkloric and passé by the country’s forward-looking elite. So new music was commissioned by Mariano Egaña, one of Chile’s founding fathers and lead writer of its constitution. While in London, Egaña pitched the idea to Catalan composer Ramón Carnicer, who was living in exile in the British capital for his liberal ideas. Carnicer wrote the new score in 1827, keeping the original lyrics. The following year, he returned to Barcelona, where he became conductor of the Italian Opera. Meanwhile, his new Chilean anthem debuted in the new world on December 23, 1828, at Santiago’s Arteaga Theatre. Almost two decades later, in 1847, a final change was made, replacing the original lyrics, which some considered an affront to Spain, the Motherland. The Chilean government asked a young poet named Eusebio Lillo to write the new lyrics. Today, the most commonly heard rendition includes the original chorus by Vera y Pintado plus the fifth of Lillo’s original six verses. During the bloody military dictatorship of Augusto Pinochet (1973-1990), the militaristic third verse was officially incorporated, with its references to “brave soldiers” and “the death cry” of battle. That verse was dropped when democracy was restored, though it’s still included when the full anthem is played for military events. One curious side note: Guitarist Joe Walsh of the Eagles is said to have sung the National Anthem of Chile in 2003 at a Los Angeles Angels baseball game. That tidbit is reported on a few websites, almost verbatim, but without confirmation. Venezuela’s national anthem was not established by musical contest or government decree. It sprouted spontaneously from the fervor of the independence movement of 1810, then took root over the next seven decades before it was officially recognized as the national song in 1881. In Venezuela’s case, the controversy surrounding the anthem has not been about the lyrics or the music but rather who actually wrote them. To this day, the question of authorship has not been fully resolved. The anthem, entitled “Gloria al Bravo Pueblo” (Glory to the Brave People), arose from an effort by the fledgling Sociedad Patriótica to foment the fight against Spain. It is said that Vicente Salias, a doctor and journalist who founded the Caracas-based patriotic group, wrote the first verses of the hymn on the spot. The music was later written by violinist Juan José Landaeta, the son of free mulattoes known for his religious compositions. Both men fought in the Independence wars, Salias alongside the continent’s iconic liberator Simón Bolivar. And both were executed in the struggle. But their composition lived on. By the mid-1880s, it was considered the new nation’s de facto anthem, known as the “Venezuelan Marseillaise.” Some observers say it has more in common with the famous French anthem than with the epic marches of other Latin American nations. In 1881, “Gloria al Bravo Pueblo” became Venezuela’s official national anthem by decree of President Antonio Guzmán Blanco. The song went through subsequent modifications, the last one in 1947. Over the years, historians have argued that the music was actually composed by Lino Gallardo, a classically trained musician who was also an independence activist. 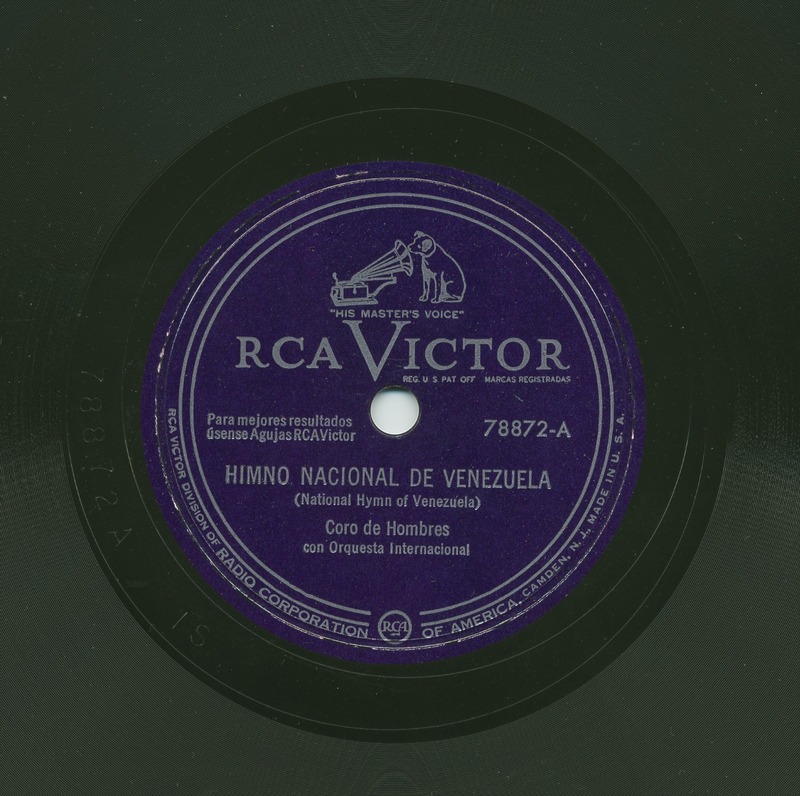 Gallardo, considered the Venezuelan Haydn, was known for other patriotic songs, especially "Caraqueños, otra época empieza" (People of Caracas, Another Era Begins), with lyrics by Andrés Bello. Some researchers also claim that Bello, not Salias, wrote the lyrics to the national anthem. Yet the challenges have never been sufficiently proven to strip the rights of the officially credited authors, Salias and Landaeta. Today, Venezuela’s national music conservatory bears Landaeta’s name. In recent years, the anthem has served as a dramatic backdrop to Venezuela’s current political crisis. During one violent protest on the streets of Caracas last year, a lone violinist stood calmly playing the hymn, captured on video as gunfire and explosions raged around him. In a separate incident, another young violinist was killed during anti-government protests. At the burial of the 18-year-old victim, who was a member of Venezuela’s storied youth music program, El Sistema, the national anthem was played by his fellow musicians from the program, with tears in their eyes and the flag held high. 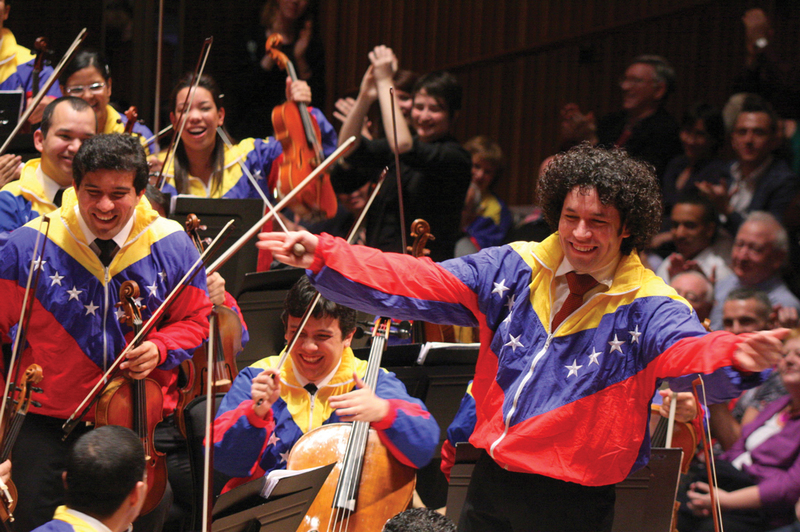 Gustavo Dudamel, artistic director of the Los Angeles Philharmonic, was also a graduate of El Sistema, which is credited with providing free musical training, and hope for advancement, to Venezuela’s poor. In this video, Dudamel conducts the Orquesta Sinfónica Simón Bolivar in his country’s national anthem. A typo in the original text of the Argentine National Anthem drastically changed the meaning of a key phrase, and created a historic controversy. The anthem, originally titled simply "Marcha Patriótica," was adopted in 1813, three years after the May Revolution that sparked Argentina’s war against Spain. Yet, the song seemed to take a stand against independence, if the original text is read literally. The offending line asserts that “Buenos Ayres (sic) se opone a la frente de los pueblos ..." That would mean that the country “opposes” the people’s front in the war of liberation, a position that’s contradictory to the spirit of the song which is virulently anti-Spain. The line was most likely a “tragic misprint,” as one historian put it, although some skeptics saw convoluted political meaning in it. A corrected version, with the same date as the original, quickly changed “se opone” to “se pone,” reversing the mistake by asserting that the country “puts itself” at the front. What a difference an “o” makes. As with other countries, the Argentine National Anthem went through a series of false starts, revisions, and restorations over the years. After earlier anthems were rejected as inadequate, the current lyrics by lawyer and politician Vicente López y Planes were approved on May 11, 1813. Blás Parera, a Spanish composer and music teacher, wrote the music and conducted the orchestra at its theatre premiere less than three weeks later. 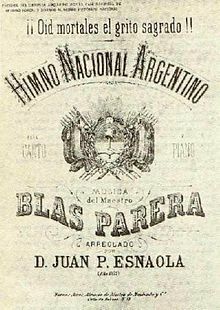 The song was officially christened the "Himno Nacional Argentino" in 1847, when it was first published under that title. Throughout the rest of that century, the complete anthem was sung, with all its hostile references to Spain. The Argentine anthem has been prominently represented in pop culture, both in music and film. Charly García, a leading Argentine alternative rock musician, recorded a modern, eccentric version of the anthem on his 1990 album Filosofía barata y zapatos de goma (Cheap Philosophy and Rubber Shoes). Authorities briefly banned it, but a judge ruled in García’s favor. The traditional anthem is also used in the soundtrack to a couple of outstanding films. A line from the lyric was used as the original title of a 1928 silent film, Una Nueva y Gloriosa Nación (A New and Glorious Nation). This lost film, a rare Hollywood and Buenos Aires collaboration, is alternatively titled The Charge of the Gauchos, or The Beautiful Spy. It’s a period piece about Argentine independence, with famed silent-film star Francis X. Bushman in the lead role as Manuel Belgrano, a heroic liberator who created the Argentine flag. More recently, the national anthem is played in the opening of 1985’s The Official Story, which won an Oscar for best foreign language film. Set in the aftermath of Argentina’s military dictatorship and dirty war, the drama tells the story of a high school teacher who sets out to identify the mother of her adopted daughter. 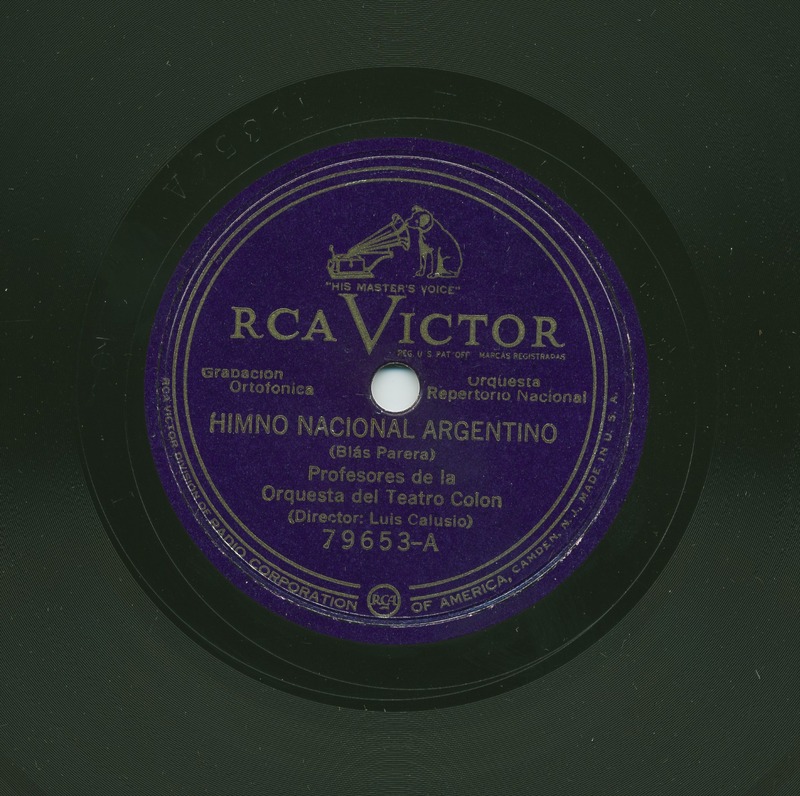 The Frontera 78-rpm recording features Profesores de la Orquesta del Teatro Colón, a symphonic group founded in 1925 at the gorgeous historic theater in the Argentine capital. This version, under the direction of Luis Calusio, is an instrumental, making moot the historic issue of the lyrics.